Also commonly referred to as the goose-beaked whale, the Cuvier's beaked whale (Ziphius cavirostris) has a stout body and small sloping head with a short beak and curved mouth giving this whale it's characteristic "S"-shaped grin. These whales have small flippers and a curved dorsal fin that measures up to 38 cm in height. The flippers, like other beaked whales, fold into a slight depression on the lower side of the body, stream-lining them for faster swimming, and the rear edge of the flukes usually lacks a well-defined central notch. Body colour varies from one population to the next, but generally tends to be light to dark rusty brown or even grey, although the head and upper thorax of older animals becomes lighter in both sexes. The eyes are usually surrounded by dark colouration. Patterns of lighter coloured patches are also present on the bodies of adults. Adult male bulls also have 2 large, forward pointing teeth (approx. 5 cm in length) at the tip of the lower jaw, which are thought to be used during competitive bouts over females during the mating season (resulting in intraspecific scarring of males in particular). The lower jaw extends beyond the upper jaw, and similar to other beaked whales, there are two "V"-shaped throat grooves. 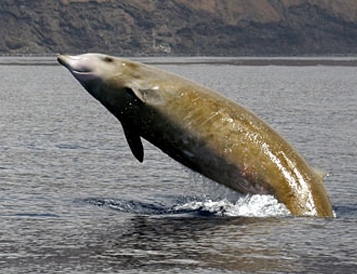 Cuvier's beaked whales are widely distributed in offshore waters and can be found from the tropics to the polar regions in both hemispheres. They have the most cosmopolitan range of any of the 21 or so beaked whale species, and can be found nearly anywhere in deep water greater than 200 metres –although they seem to prefer waters with a steep topography over or near the continental shelf. The species is found in many enclosed seas such as the Gulf of California, Gulf of Mexico, Carribean and Mediterranean Seas and the Bay of Biscay. Whilst only 6 live sightings of the species have been confirmed in UK and Irish waters in recent years, strandings around the UK and Ireland are not uncommon. Measuring from 5 to 9 metres in length and weighng up to 3,000 kg, females are thought to reach sexual maturity at 5.8 metres in length, whilst males become mature from 5.5 metres. Newborn calves can measure from 2 to 3 metres at birth and weigh 250 to 300 kg. Seasonality in calving is unknown as is the life expectancy. Like all beaked whales, this species prefers deep waters for feeding, and feeding dives of up to 137 minutes to depths of almost 3,000 meters have been documented . Although few stomach contents have been examined, they appear to feed primarily upon deep water squid, but also sometimes take fish and even crustaceans. They apparently feed near the bottom and in the water column, and employ suction feeding to draw prey items into the mouth at close range. They may sometimes ingest non-prey items. Cuvier's beaked whales can be found in small groups of 2 to 7 animals, but are not uncommonly seen alone. The species can sometimes be seen breaching. However, the behaviour of Cuvier's whales tends to be rather elusve, which can make them notoriously difficult to approach and study.